For first-timers to Ipoh, these outlets appear to be nothing fancy and most people would just brush them off as old restaurants looking to survive in these modern times, while trying to combat the next wave in the F&B scene: the café invasion. However, for the locals, these are eateries that have retained their charm these past few decades; proudly guarding age-old family recipes handed down from at least two generations back. 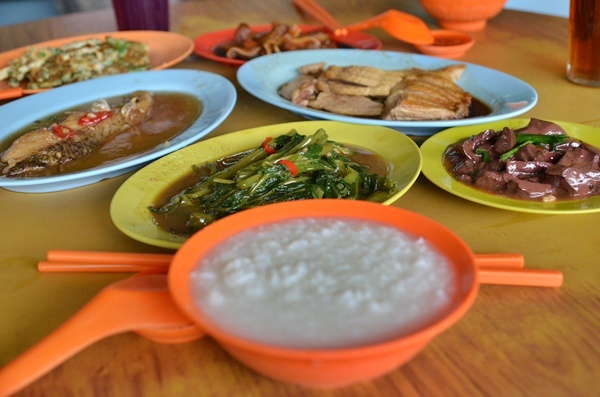 Hung Wang Eating Shop is a fine example of a traditional Teochew porridge stall in Ipoh. They operate for a mere few hours per day; starting early before lunch and serving their pre-cooked dishes (and a handful of freshly-cooked ones) until early evening only. Come early to beat the lunch crowd which is a mix of septuagenarians, middle-aged retirees, the office crowd looking for a simple and quick lunch, or even school-going youngsters. A quick glance around the counter and what do you see? 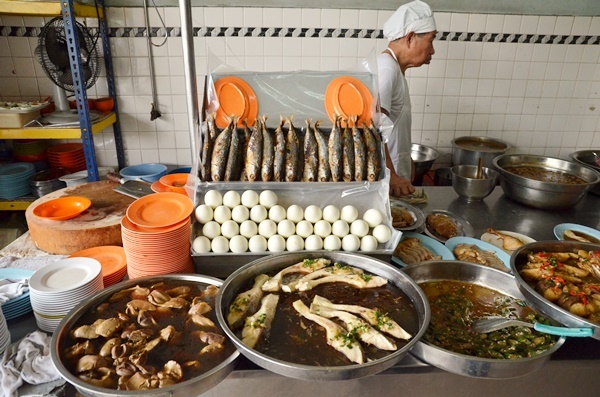 A mouthwatering display of dishes; from the classic hard-boiled salted egg, steamed fish Teochew style, braised duck, pork or tofu to the fear-inducing (to the uninitiated, at least) coagulated pig’s blood cubes. Every dish is priced rather reasonably, an average of RM3-5 per dish which encourages over-ordering since the portions come in tapas-size plates. 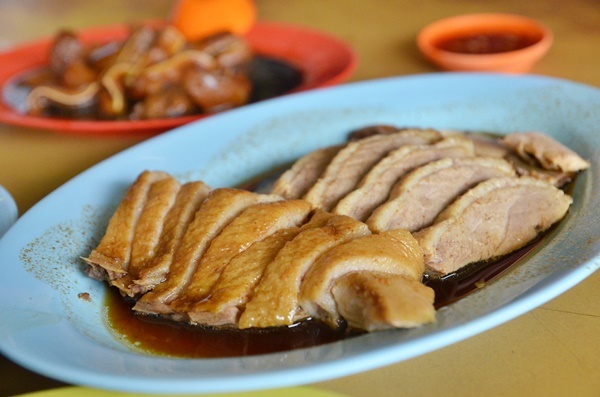 One of the absolute must-try here is the astonishing braised duck. Yes, a superlative that’s probably best kept for movies about superheroes but the braised duck at Hung Wang is a result of the the skilful mastery of the cook; resulting in a very tender piece of duck infused with the pleasant flavours from the sauce. Now, if you are one Teochew food fanatic, then you must have heard about how the braising sauce is never fully finished at the end of the day, but is instead “recycled” every day together with a new batch of sauce. This is brought to a boil to prevent any possibility of microbial growth, so you get a sauce that is stronger and more full-bodied in flavour over time. 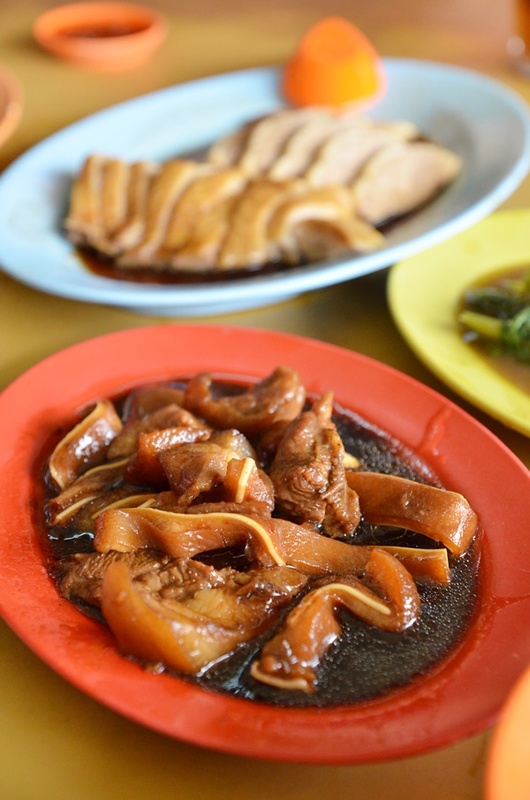 There are a myriad braised dishes here to show off that fine, culinary skill or secret sauce handed down through the generations; the braised pig’s ears, braised pork and braised tofu are three dishes you can sample and pass your judgment over. We had the pig’s ears and the verdict… it is excellent. 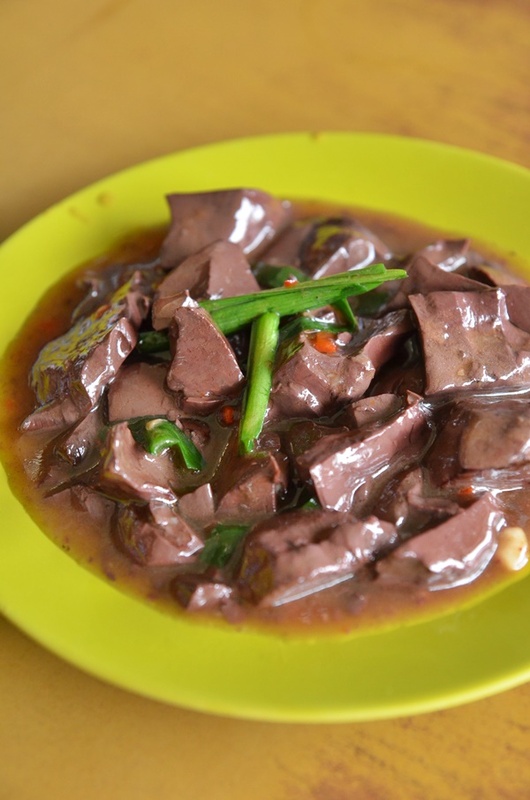 The sheer thought of pig’s blood may make your skin crawl, but in fact, how they create such a sumptuous dish from the jelly-like, coagulated blood cooked simply like a stew with chopped scallions and a faint hint of spices got our attention. The pile of greyish-maroon mush might have scored low in the aesthetics department, but in this age of sustainable eats (eg. insects) and head-to-tail gastronomic experience (so as to not waste any part of an animal), I guess pig’s ears and blood are good sources of nutrients. The next time you get seriously irritated by the jaga kereta men over at the dim sum stretch, or simply had too much of the sinful food in Ipoh, come to Hung Wang to cleanse your angry mind or soothe your battered digestive system. 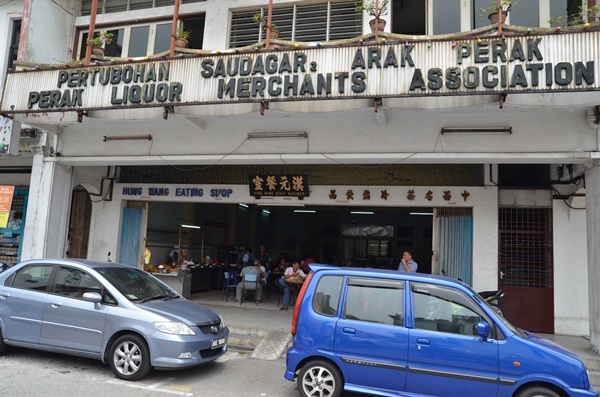 If you still fail at your attempt to secure a parking space here, push your luck at Jack Fah Teochew Porridge stall further down the road, or Yew Ming Restaurant in old town near to the towering Maybank building. 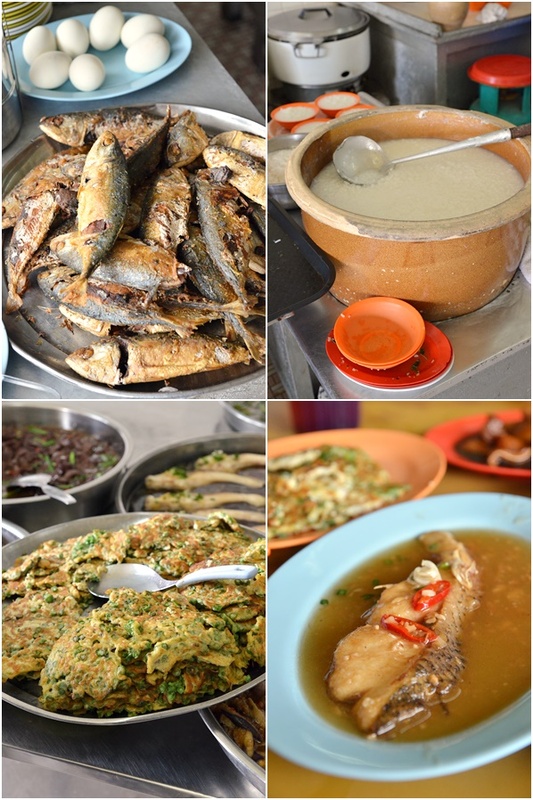 Both of these serve Teochew porridge as well, but each with their own specialty dishes. 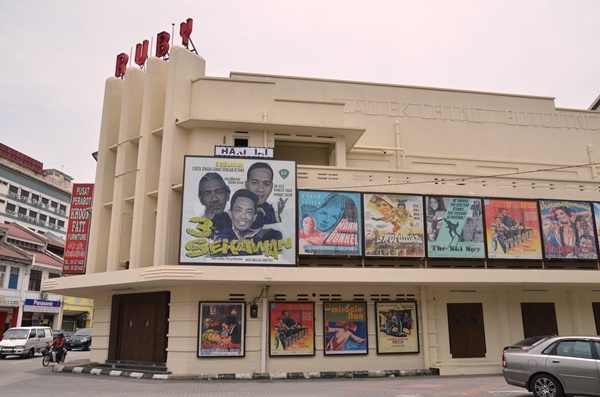 7 & 9, Jalan Leong Sin Nam, Ipoh, Perak. Opens from 11am + until 4pm or all dishes are sold off.